Happy Wednesday. 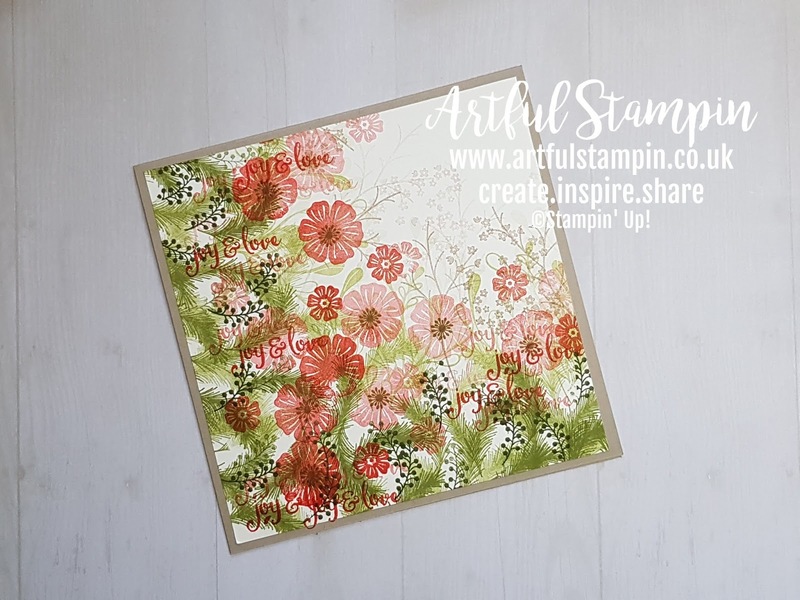 We've been enjoying some lovely weather here in Mid Wales, apparently reaching record temperatures. 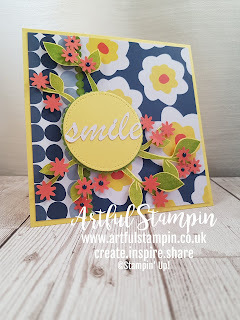 My children are on their half term holiday, and we're looking forward to a cinema trip today. 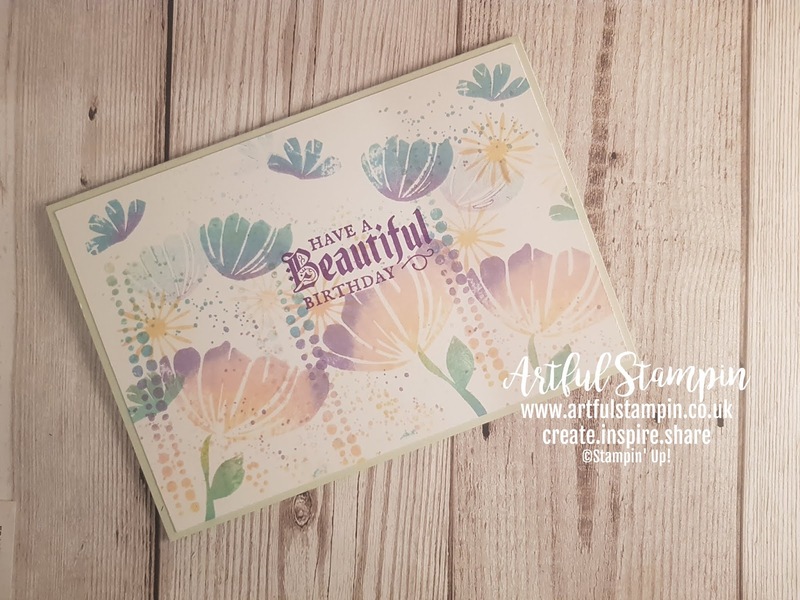 I've used this technique several times, and each time I use it I love it. 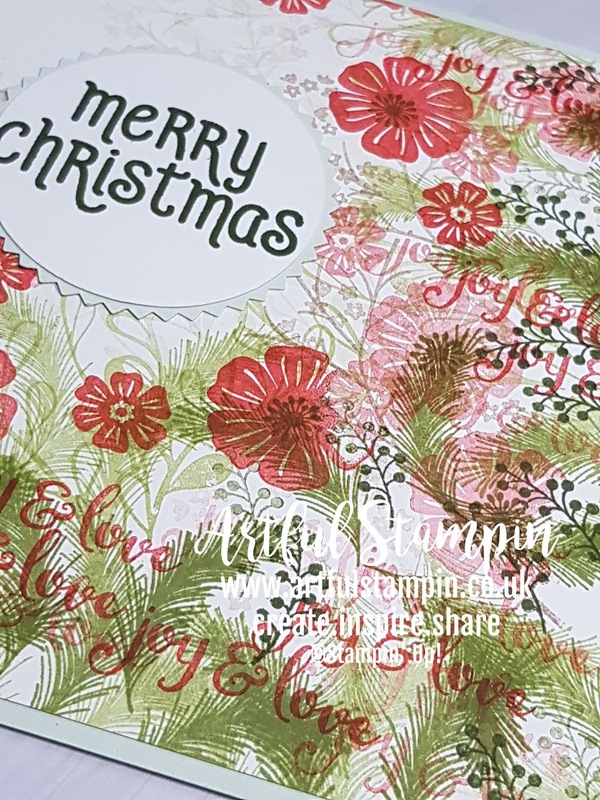 It does require having some of the Reinkers that Stampin' Up! 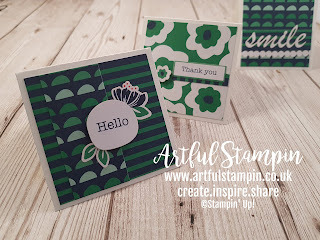 sell to refresh their ink pads. 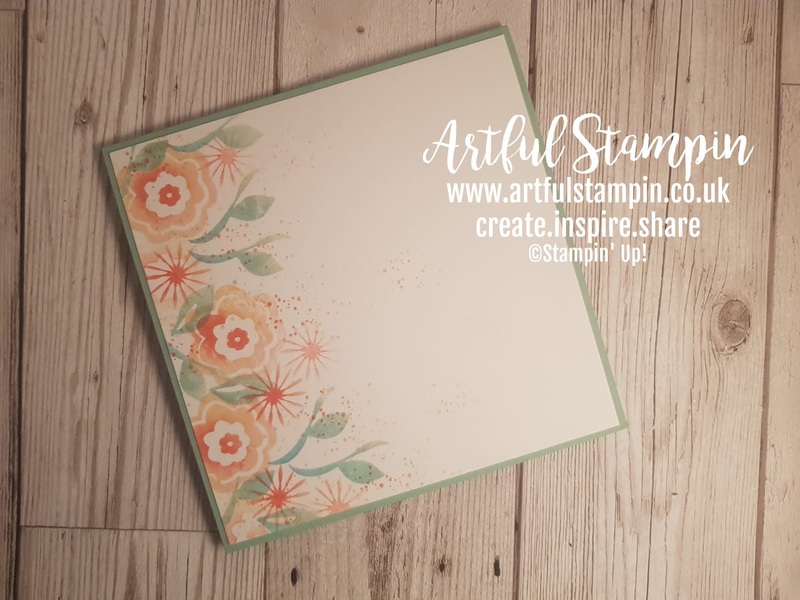 When I filmed this I wanted to get the most out of the custom ink pad I had made. 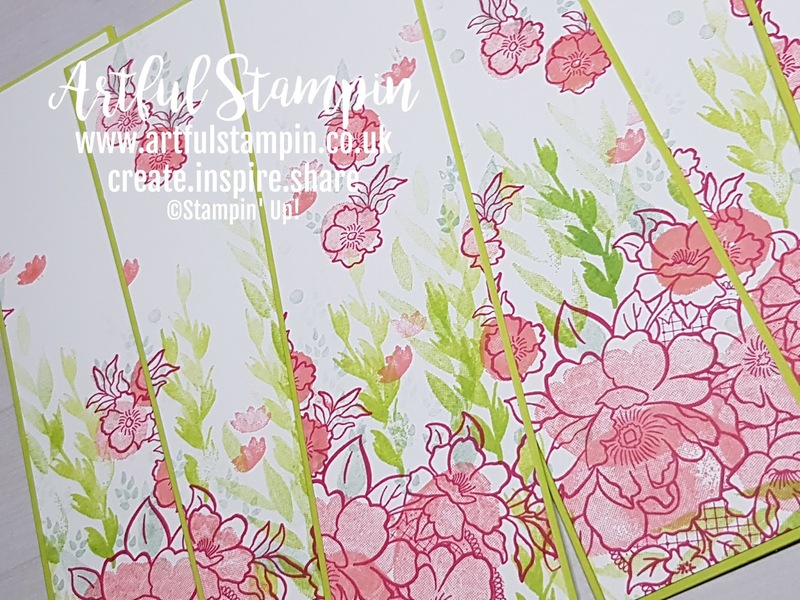 So to start off with I stamped 3 sheets of A4 , then another one. 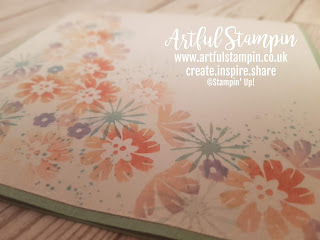 Then... 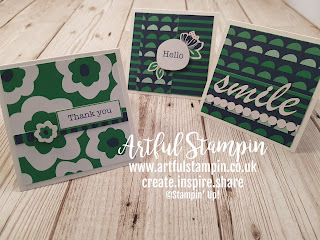 I then went on to create several more individual cards. In total I finished up with 20 cards, I did add a few drops of extra colour towards the end. Here are the ones made from the one sheet wonders. 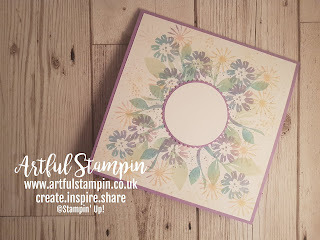 These are the cards I stamped, I have deliberately left the circle unstamped until I know who I'm giving this too and for what occasion. 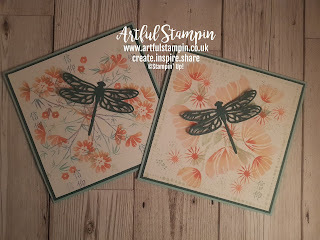 I loved how these designed teamed up so well with the dragonfly die cut. 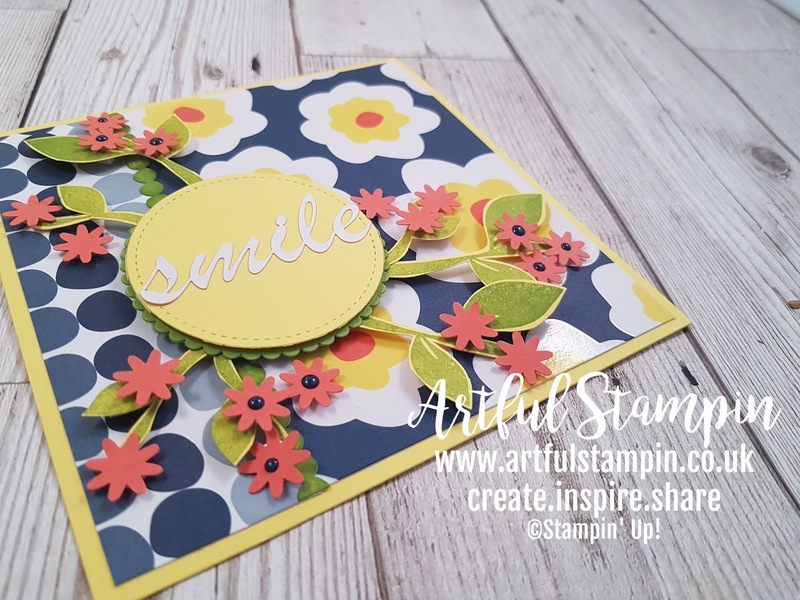 Here is the video tutorial, enjoy! 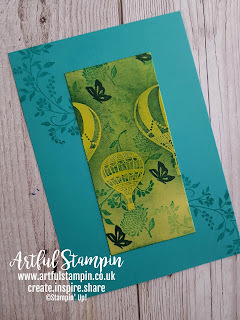 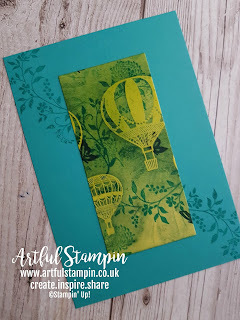 The challenge this month is to create a background, and use it to make 4 items, they could be cards, bags, tags or whatever will help you with your Christmas crafting. 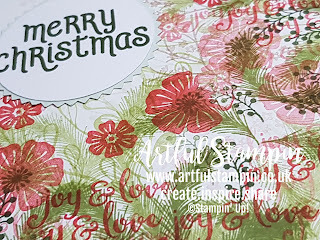 I used the Beautiful Bouquet and Mistletoe Season stamp set and stamped onto a 12 x 12 piece of Very Vanilla card stock. 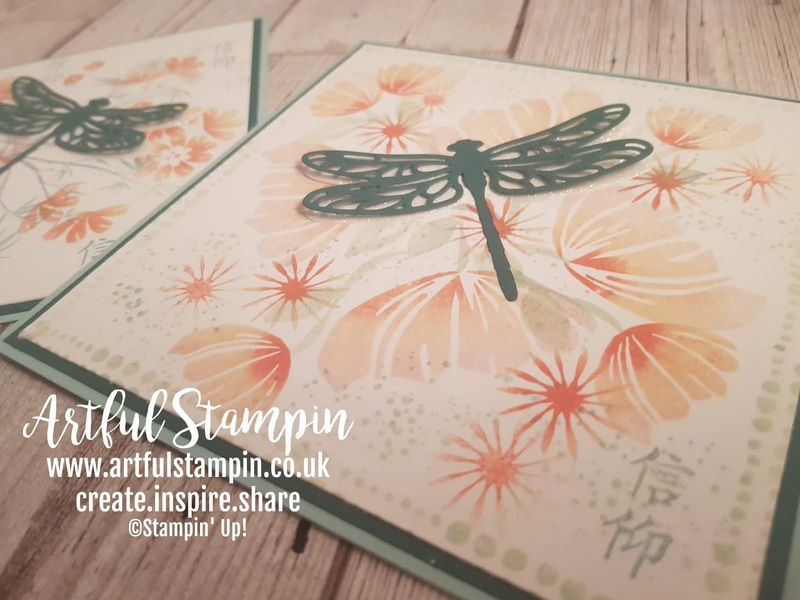 These are cards I made from the background I stamped. 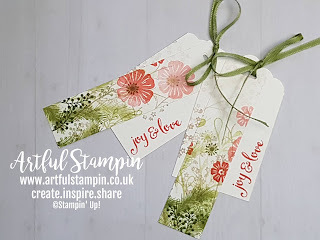 I also used up some slithers of card I had left to make some tags. 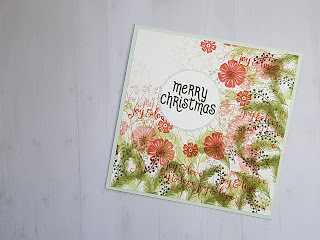 Thank you for popping to my blog from the lovely Yvonne. 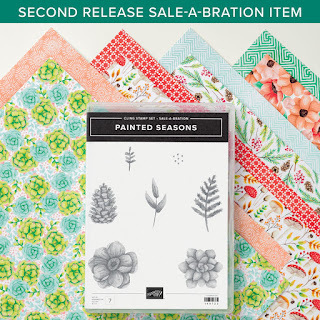 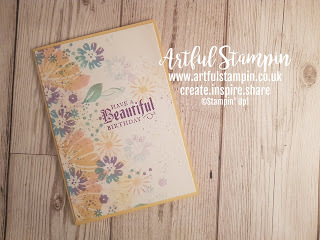 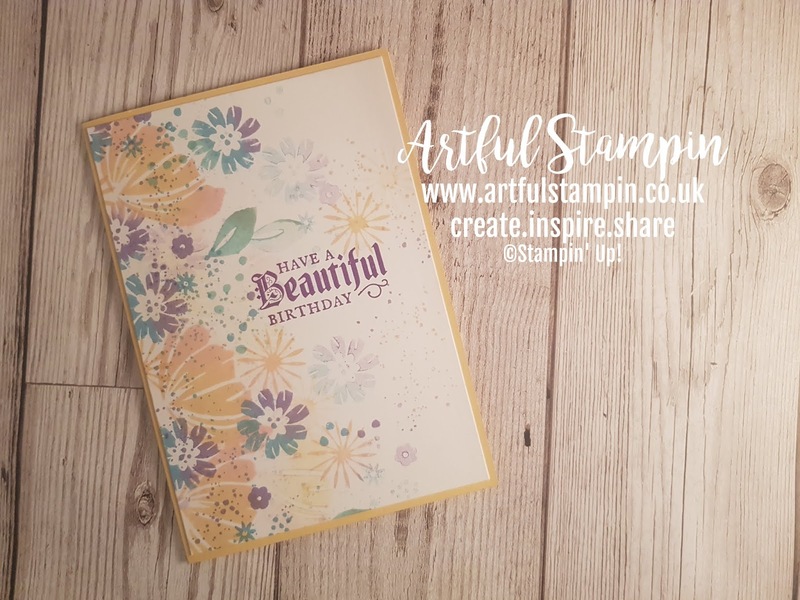 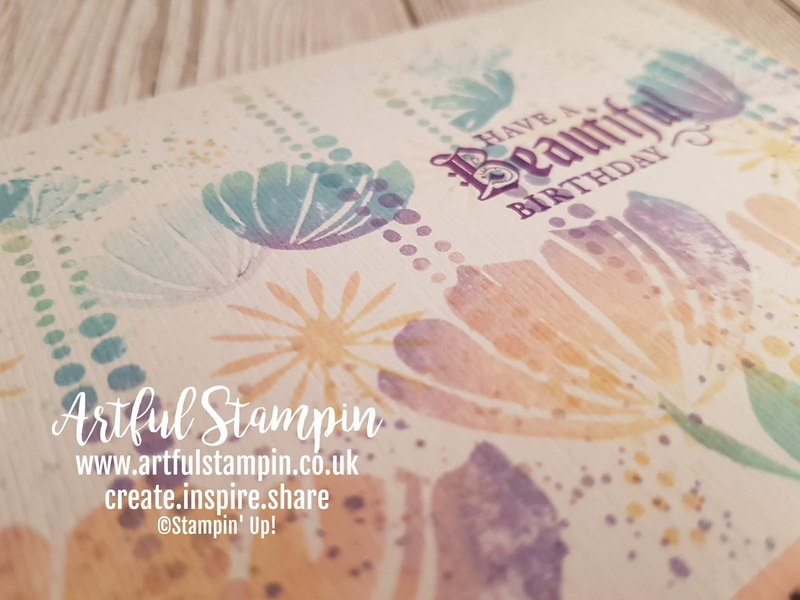 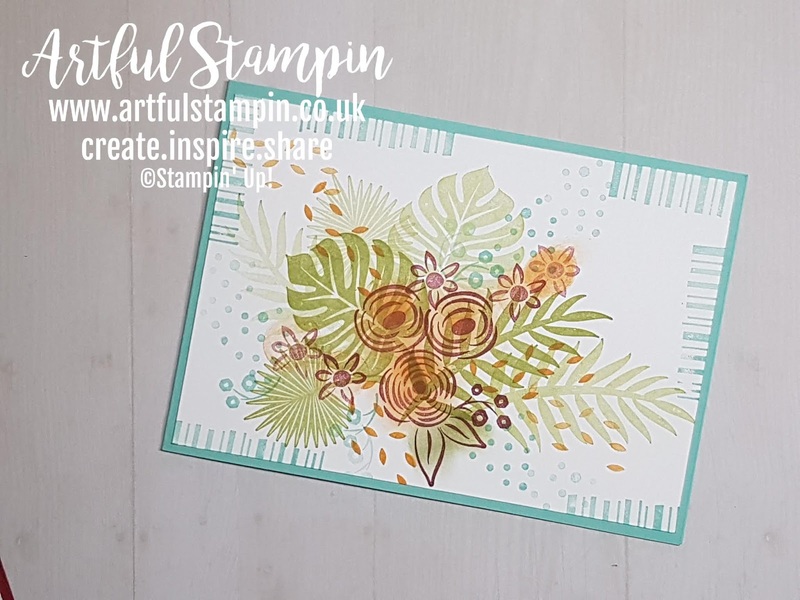 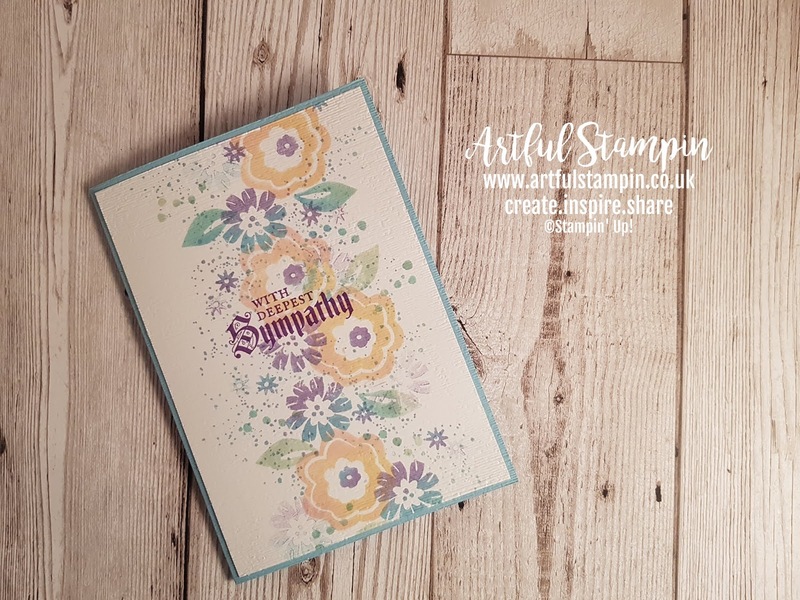 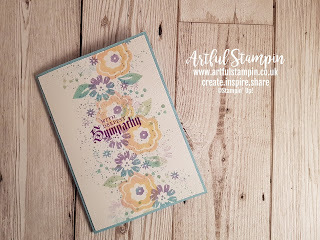 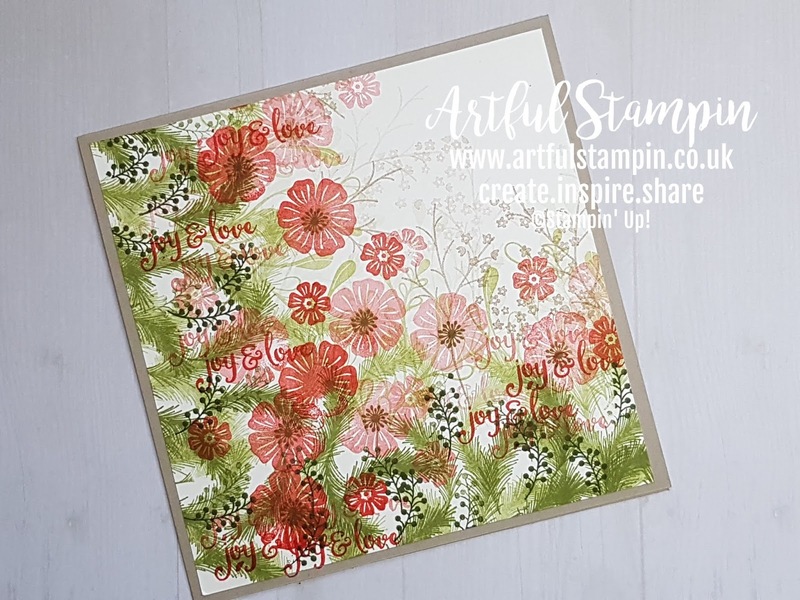 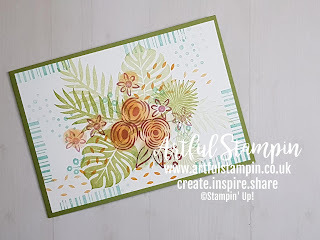 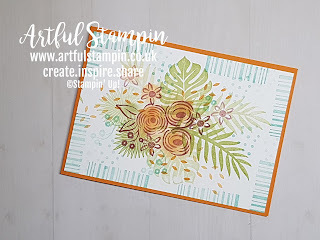 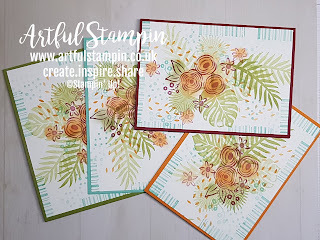 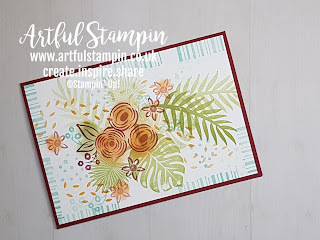 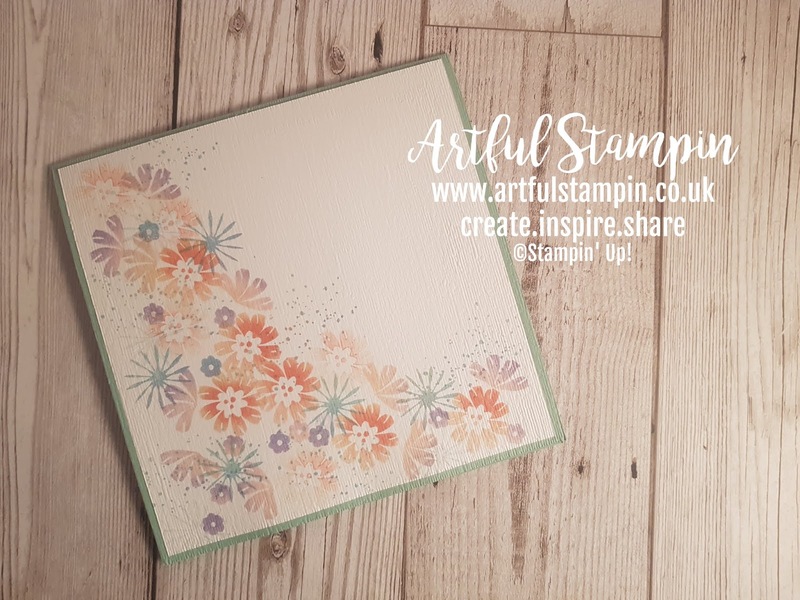 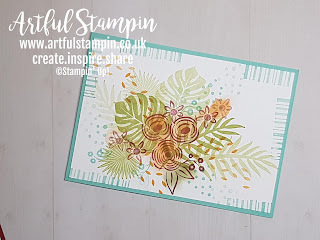 It's the Sunday blog hop and we have a wonderful selection of cards and projects using the Happiness Blooms Suite. 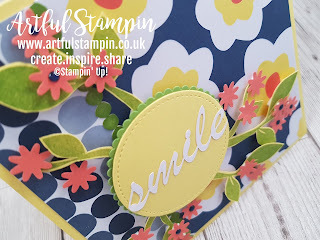 It's packed full of bright colours and retro floral styling. 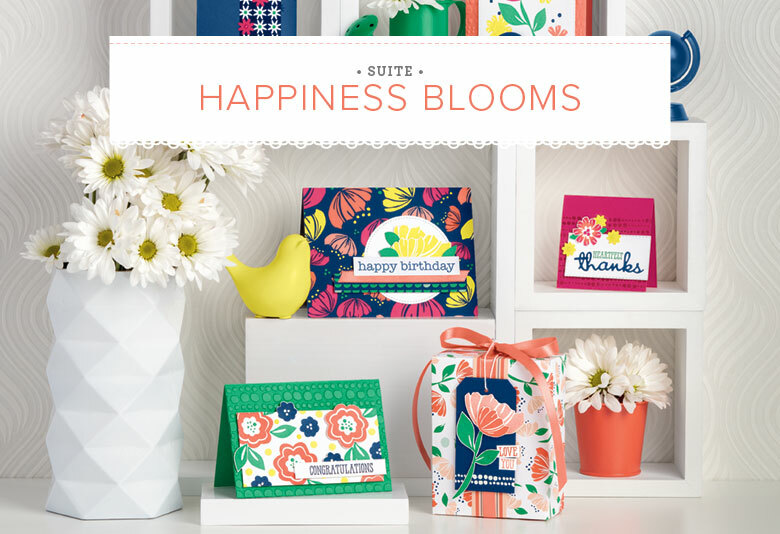 Here are 3 approaches with various elements of the suites. The first is a set of 3 small cards - these were really simple to make, only requiring the Memories and More pack that accompanies the suite, a trimmer , card and some adhesive. 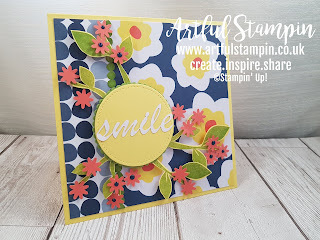 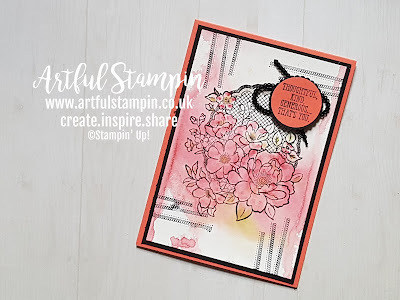 The second project is this bright and fun card highlighting one of the little floral punches. 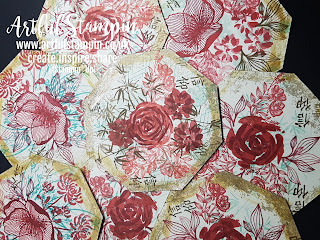 The third project is stepped up a bit further. 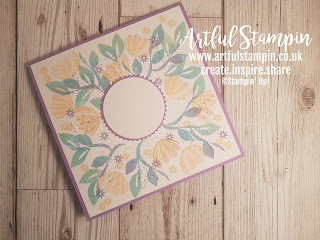 I fussy cut some of the leaf stamps so they could flow from the focal point. To see how I put the cards together, please have a look at my video here. 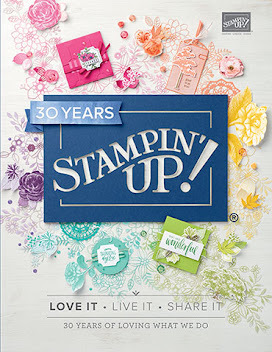 To see all the other amazing participants click on the links below. Phew, getting in here by the skin of my teeth. I've had a busy few days, and although I managed to have this video filmed and edited, I'm just getting round to posting it! I decided to do a one sheet wonder that could be turned into 4 cards, they've been left blank for now, but has areas I could add a sentiment to if needed. 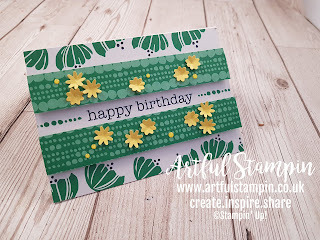 I love techniques that are quick and easy, but also have an element of the unexpected. 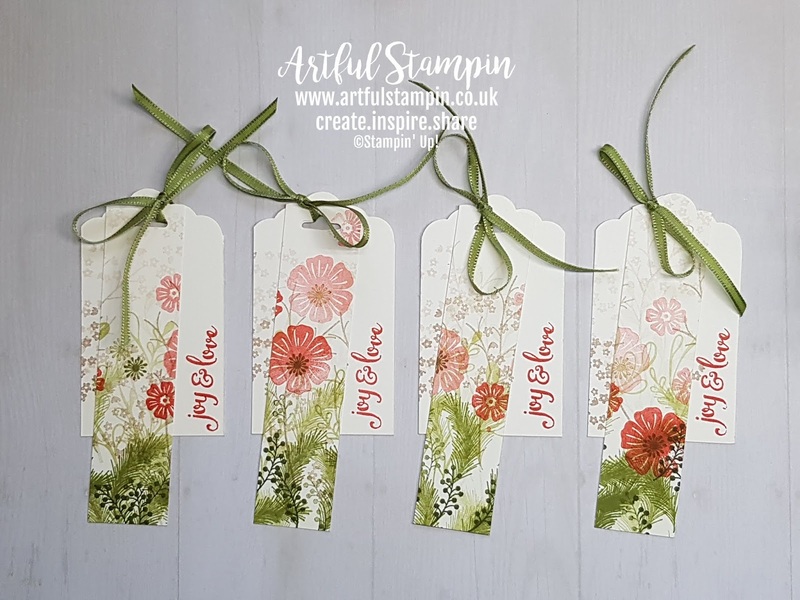 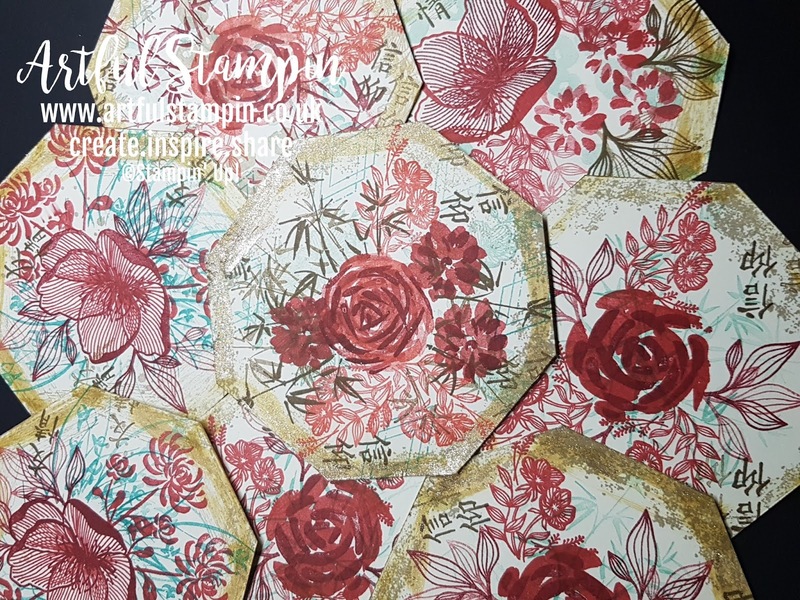 I discovered it a while ago, and love to try it on floral stamps. This stamp set is FREE with a £45 order. 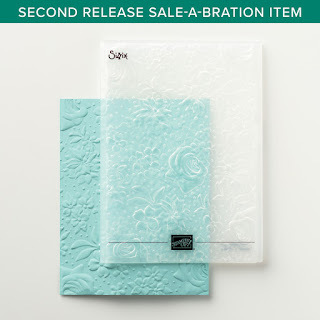 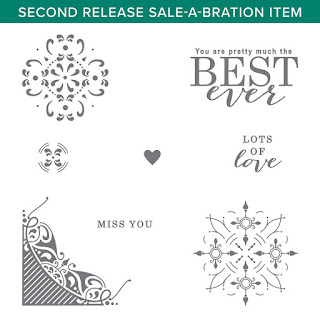 There have been some new additions to the Saleabration choices, for a £45 spend they are a stamp set or embossing folder. With a £90 spend it's a stamp set AND a set of coordinating papers. 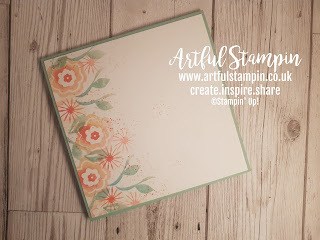 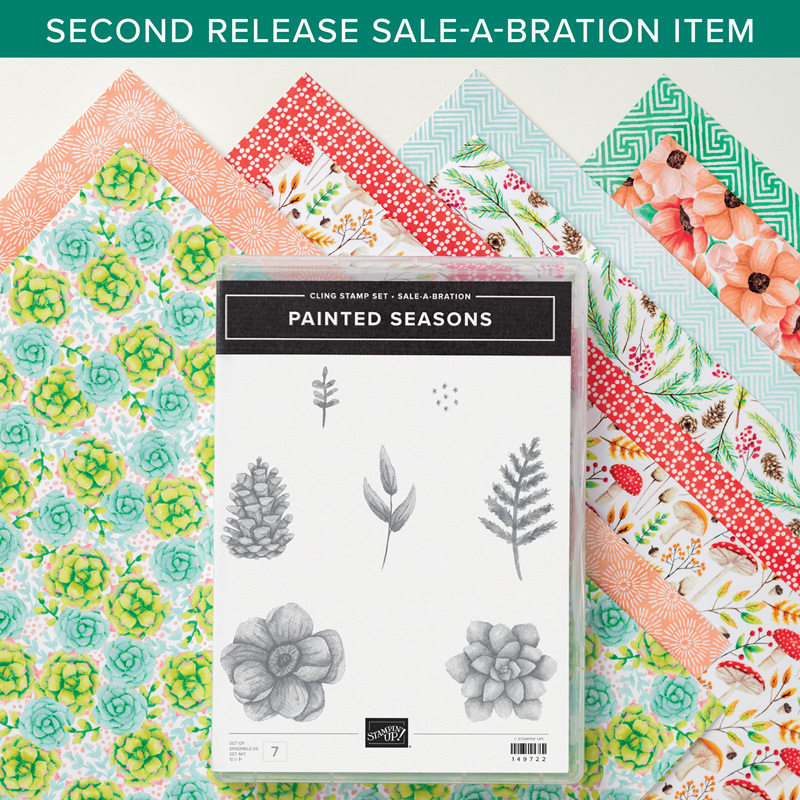 The florals are so pretty, and even more good news, in March there will be a die set available to purchase that matches the stamp set. 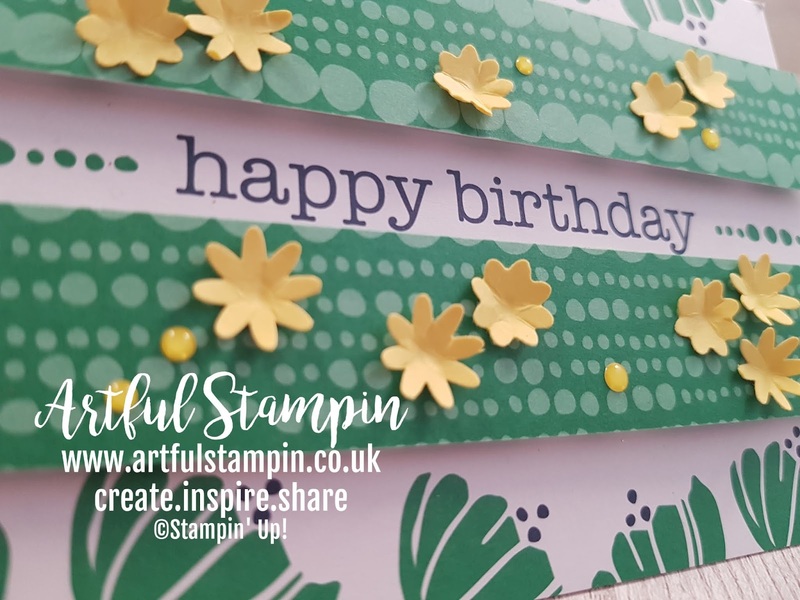 Happy One Sheet Wonder day! 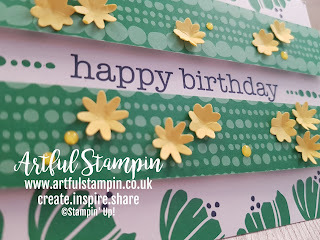 I thought I had a new video to share today, but alas not, however I found this one that I had uploaded months ago and forgot to share with you. 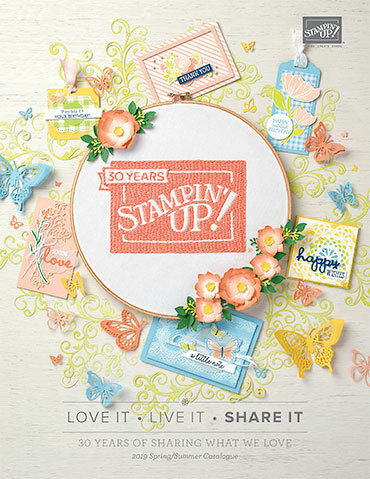 I filmed it back in November last year when I was making swaps for a Stampin' Up! 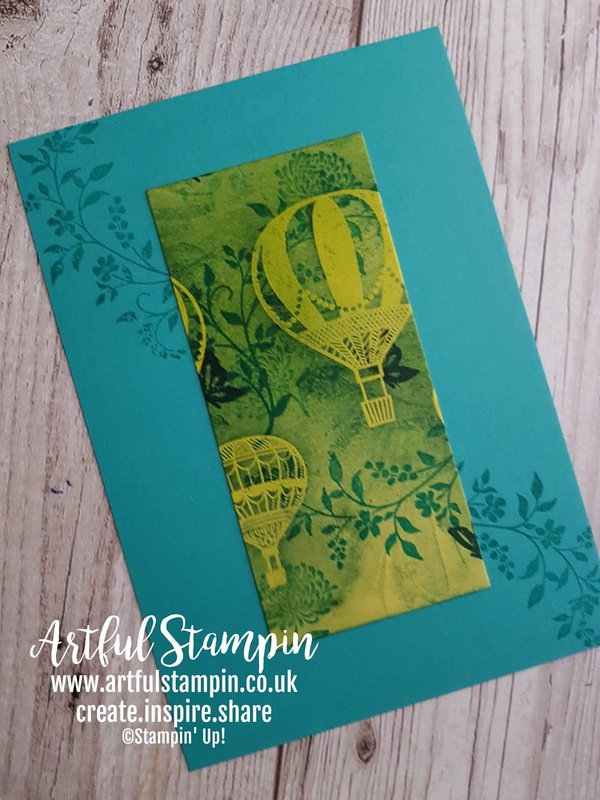 Demonstrator event. 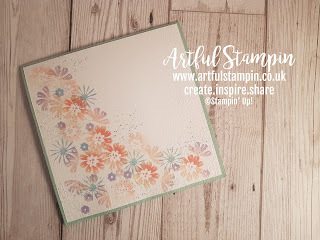 Anyway, it uses one of my favourite techniques, enjoy! On Tuesday we had a gathering of friends at our house to celebrate Chinese New Year. 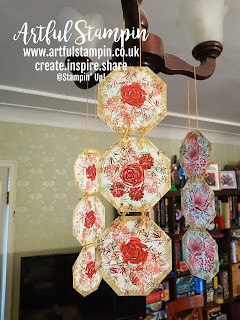 I wanted to decorate the house a little so had ordered some paper lanterns. 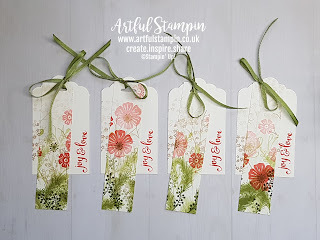 Then I thought it would be nice to stamp some hangings that I could keep from year to year and add to. 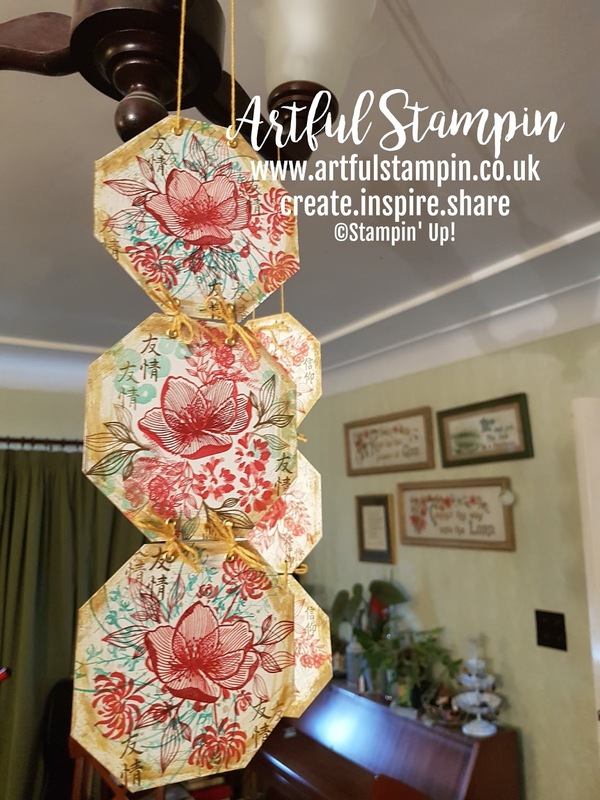 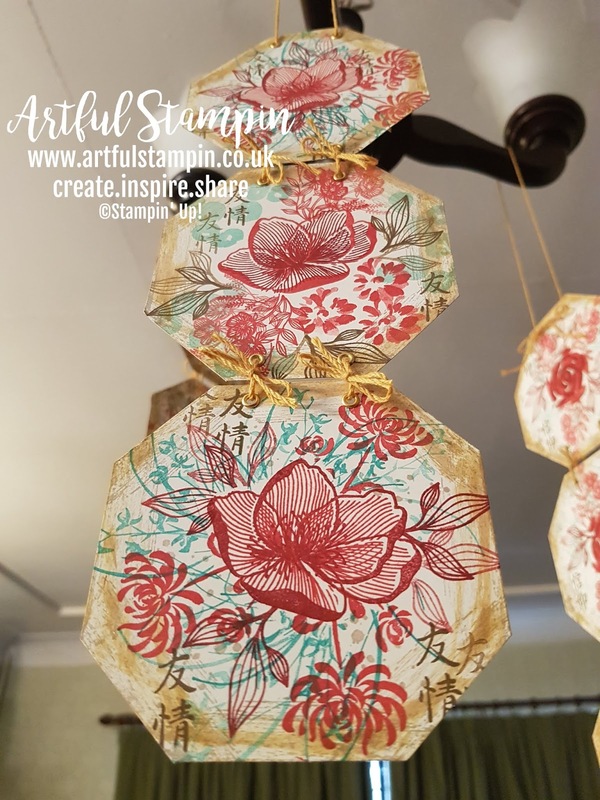 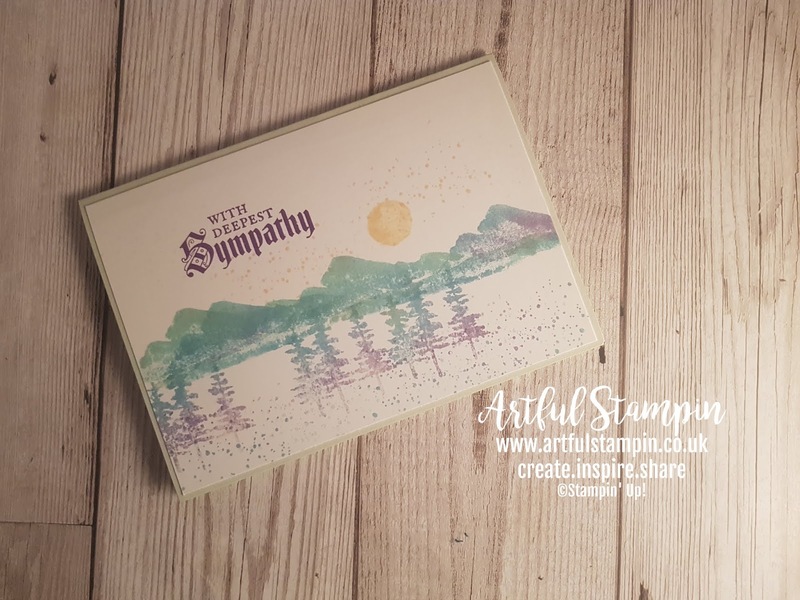 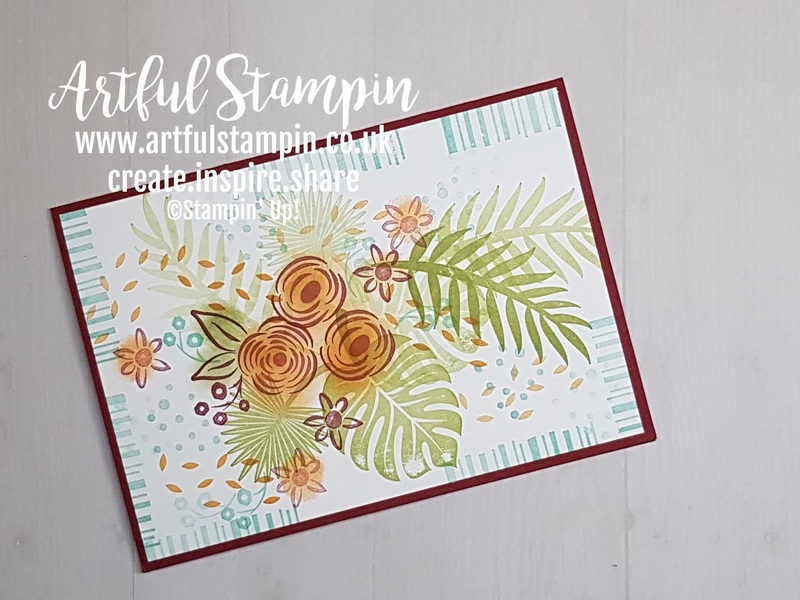 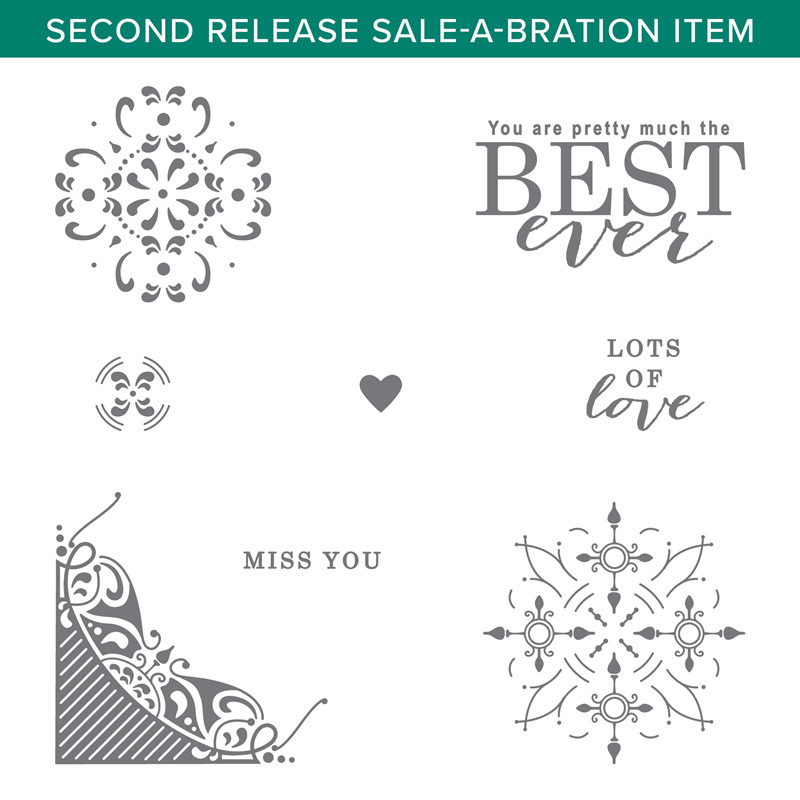 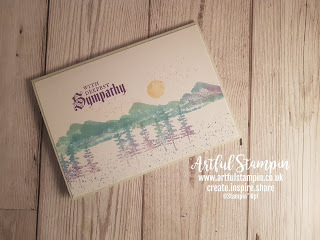 Taking the popular octagon shape as a base, I choose some stamps that I thought would look good together, they included; Artistically Asian, Abstract Expressions, Timeless Textures and Beautiful Promenade. 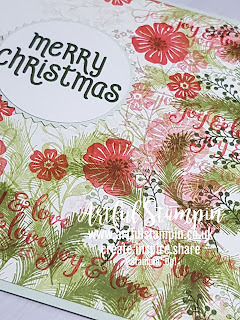 I made them "live" on YouTube. Just wanted to share something I found out recently, you can change the setting of the speed at which you watch videos. 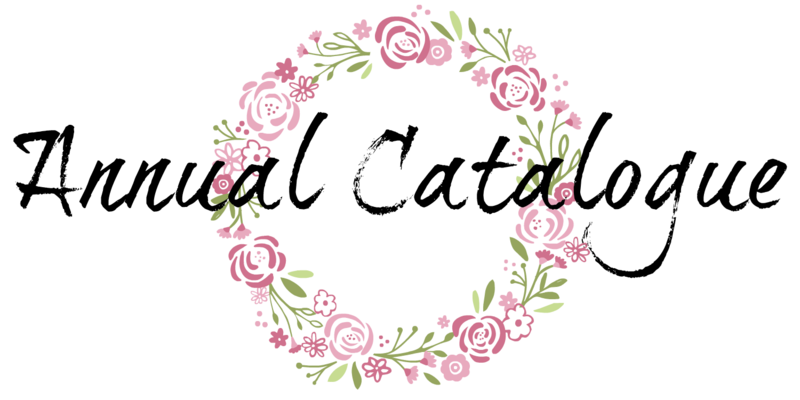 Click on the settings "flower" and click on speed, from there you can choose a faster running speed.